In spite of different expressions being used in text books, since the beginning of the 20th century already the concepts of Diathermia, Hyperthermia and Endogenous Thermotherapy have been linked to electromagnetic fields of elevated frequencies, applied to the organism’s tissues. The purpose of this application is the augmentation of the internal temperature in order to thusly induce the various therapeuthic effects. In the case of CAPENERGY, we are talking about a device that generates an alternating current with a frequency of 0,8 MHz, 1 MHz and 1,2 MHz, creating an application current. This circuit includes a pair of electrodes to apply the mentionned alternating high frequency on the patient’s body, which becomes a part of the electrical circuit. The insulated electrodes differ in shape and surface, and can be applied manually by the operator by a massage or automatically by placing them on the surface of the skin (plate electrodes). In either case, be it metal or insulated electrodes, the body produces a series of physical phenomenos based on the “condensor effect”. When an alternating current is applied between the cramps of a consendor, every point of a di-electric between the cramps obtains an alternating and variable tension so that every molecule located in the space between the two cramps polarizes into a dipole. This dipole orientates itself according to the applied tension. The change of orientation of the dipoles with the alternating tension allows for the passage of the current through the condensor. We therefore make use of an electrolytical displacement of a second type: the human body. The second class conductors are those in which the transportation of the current takes place through a physical displacement of ions through a liquid. We consequently have a two-way current passage, joined to the physical movement of the ions, which is slower than the movement produced in first class conductors. This why the intensity of the current which runs through the condensor is called ‘displacement current’. 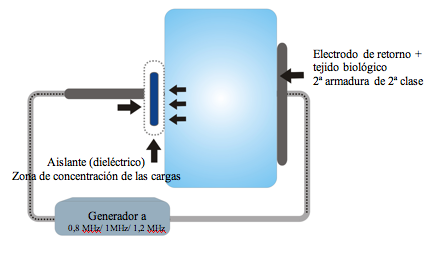 In this specific case, you could say a condensor (CAPENERGY) is applied to the organism, which, for its part, mainly consists of a series of internal consendors. The simplest example of a condensor is the cell itself – living unit of the human body formed by a fosfolipidic (isolating) membrane and by an internal conductor (cytoplasm), rich in liquids and electrolytes. In the Thirties, diathermia becomes a standard method for physical therapy and, in many fields, for medicine and surgery. From the Eighties on, there is a new increase in the use of Capacitive and Resistive (direct coupling) devices, which cause a noticeable degree of satisfaction among patients as well as operators. 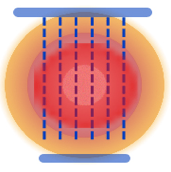 The advantage of the heating of tissues through electrical high frequency currents in comparison to other forms of heating used for medical purposes (conduction, infra red radiation), can be found in a better penetration of the phenomenon of the tissue itself (upto several centimeters) and the consecutive obtention of a larger treatment efficiency. The term DIATHERMIA is derived from this conversion from current into warmth (DIA= through, THERMIA= warmth). The study of the condensor effect revealed new possibilities in comparison to anterior methods. In this case, the mechanism for generating warmth is completely different, considering the fact that it is possible to increase the internal temperature without using sources of exogenous warmth. This tendency of the electrical current towards increasing the conductors temperature as an expression of the disappearance of the potency is being used in order to increase the internal temperature of the tissues. The body can in fact be considered as a conductor of the second type and offers capitance and resistance when the current passes through. On the other hand, the exitability of the tissues and the electrolytical phenomenons that are generated, demand a precise selection of the type of current that will be applied. The continuous current does not only have no excito-motorial effect, it also presents the peculiarity of producing negative collateral effects such as a temperature rise and an electrolysis increase, which can seriously dammage the tissues. The alternating low frequency current does not provoke electrolysis, but it nevertheless interferes with the nervous peripheric stimulations, becoming inapplicable for an efficient heating. 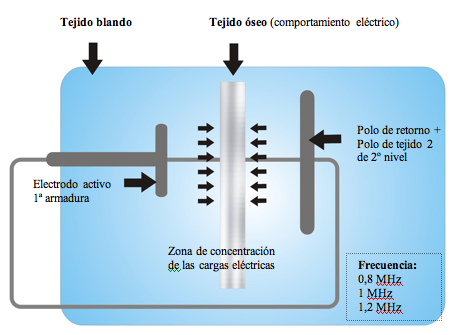 The high frequency current, on the contrary, has proven to be very adequate for heating, since it does not have any electrolytical effects nor excito-motorial actions thanks to its high frequency. Based on everything we’ve explained before, high frequency can be defined, from a medical point of view, as a thermotherapeuthical procedure for the conversion of electrical energy that uses very alternating currents of very high frequencies.